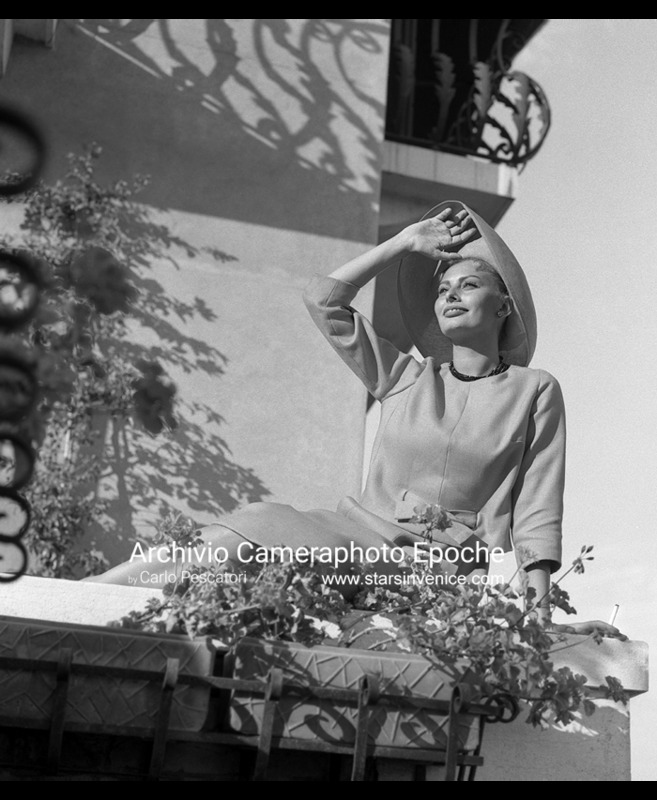 Sophia Loren on a Grand Canal balcony, Venice 1955 (Photo by Archivio Cameraphoto Epoche / © Carlo Pescatori). Sophia Loren cuts bread with a big knife surrounded by cooks in a restaurant kitchen, Venice 1955 (Photo by Archivio Cameraphoto Epoche / © Carlo Pescatori). 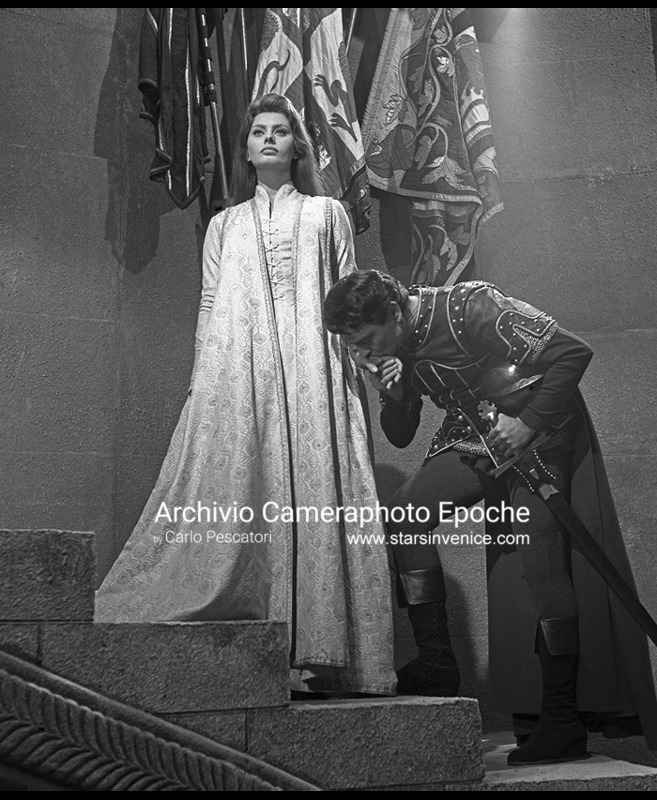 Sophia Loren dubs "El Cid", Rome 1961 (Photo by Archivio Cameraphoto Epoche / © Carlo Pescatori). Sophia Loren sits on the front seat of a car, Cortina d'Ampezzo 1960 (Photo by Archivio Cameraphoto Epoche / © Carlo Pescatori). 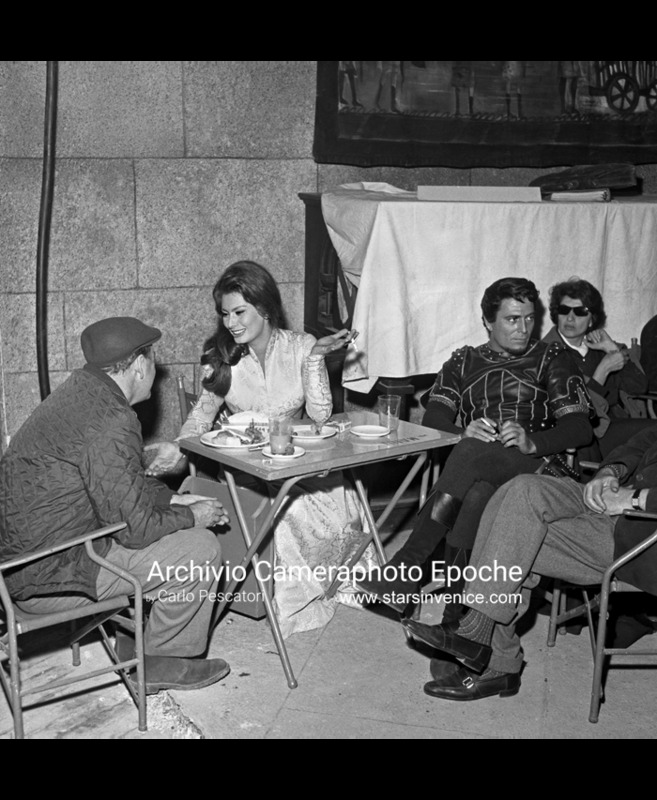 Sophia Loren has lunch with the "El Cid" crew, Spain 1960 (Photo by Archivio Cameraphoto Epoche / © Carlo Pescatori). 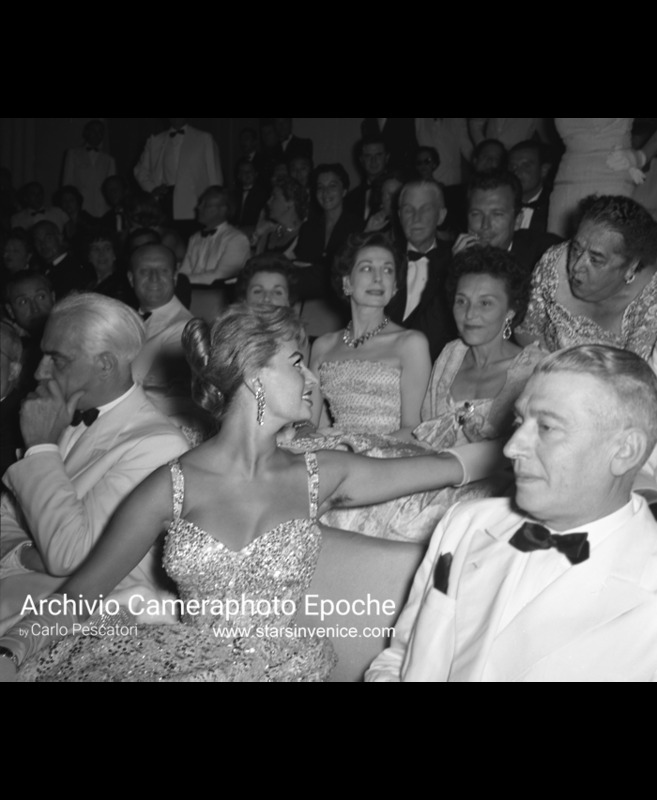 Sophia Loren claps her hands at the Venice Movie Festival, Lido 1955 (Photo by Archivio Cameraphoto Epoche / © Carlo Pescatori). 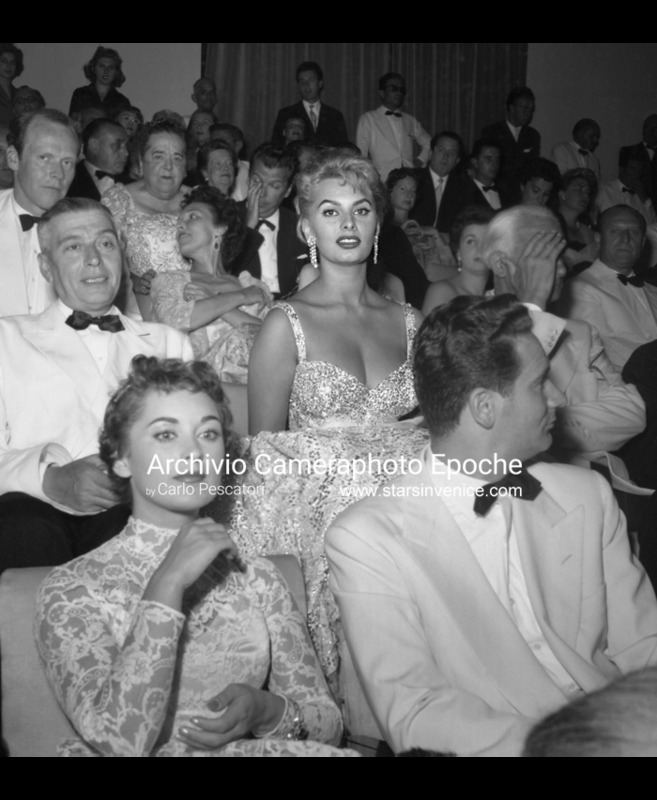 Sophia Loren sits among the audience at the Venice Movie Festival, Lido 1955 (Photo by Archivio Cameraphoto Epoche / © Carlo Pescatori). 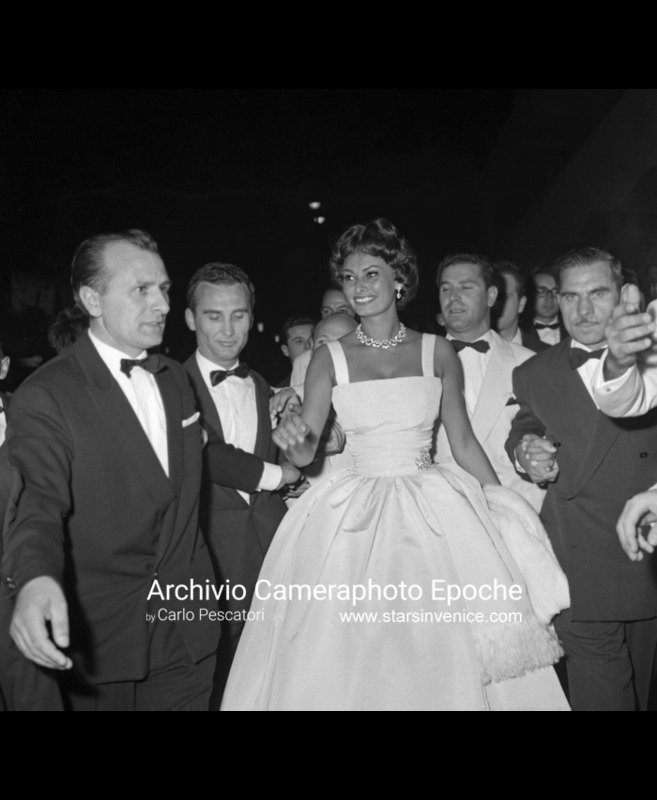 Sophia Loren walks in Lido, Venice 1958 (Photo by Archivio Cameraphoto Epoche / © Carlo Pescatori). 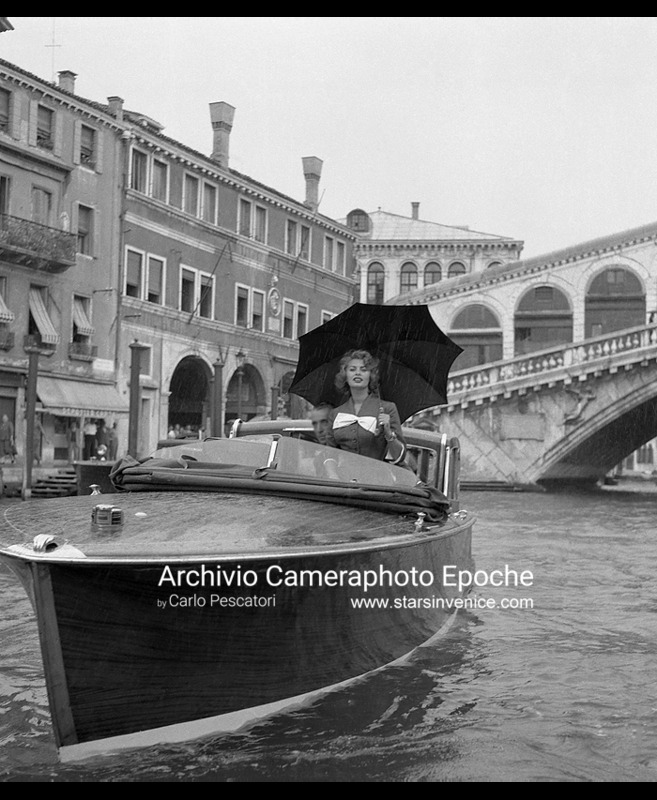 Sophia Loren on a water taxi, Venice 1955 (Photo by Archivio Cameraphoto Epoche / © Carlo Pescatori). 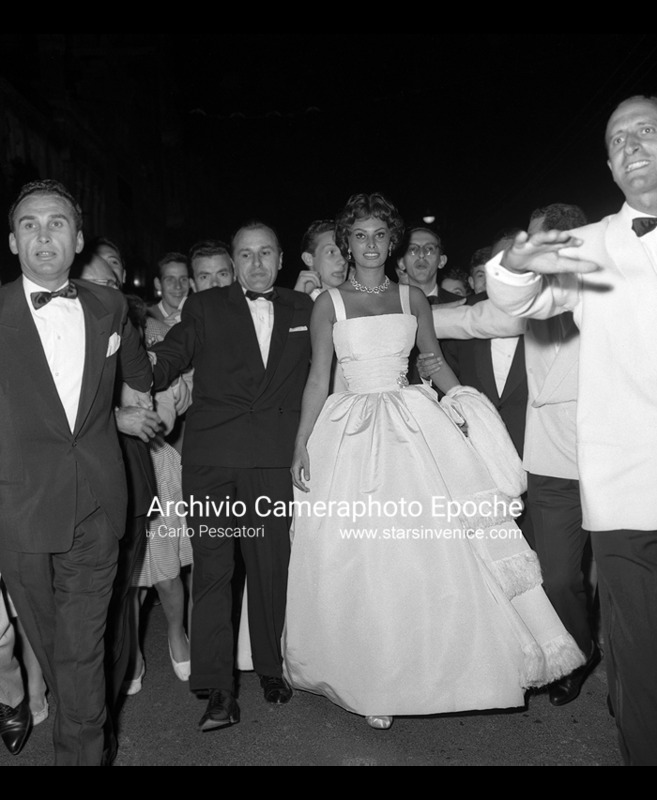 Sophia Loren walks towards the Venice Movie Festival Theatre surrounded by a happy crowd and bodyguards, 1958 (Photo by Archivio Cameraphoto Epoche / © Carlo Pescatori). 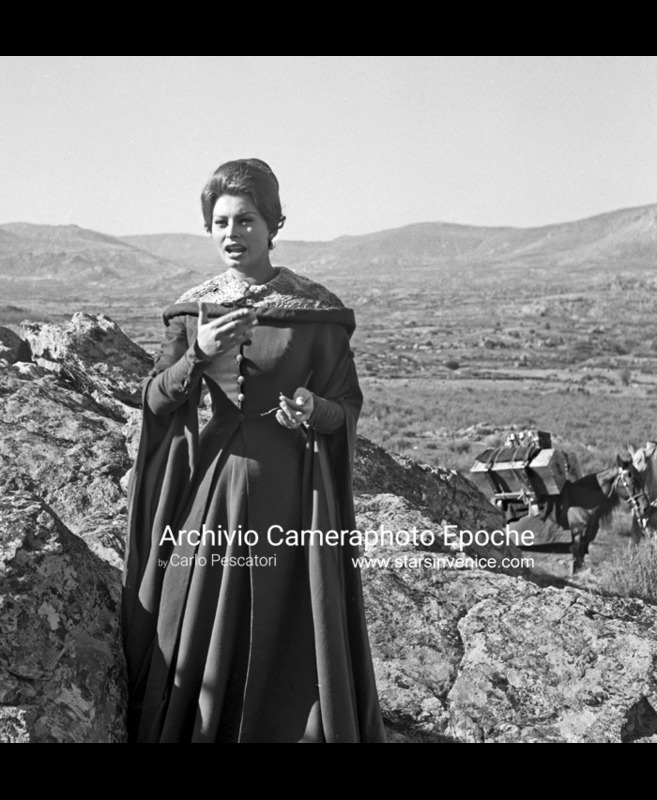 Sophia Loren on the "El Cid" set, Spain 1960 (Photo by Archivio Cameraphoto Epoche / © Carlo Pescatori). 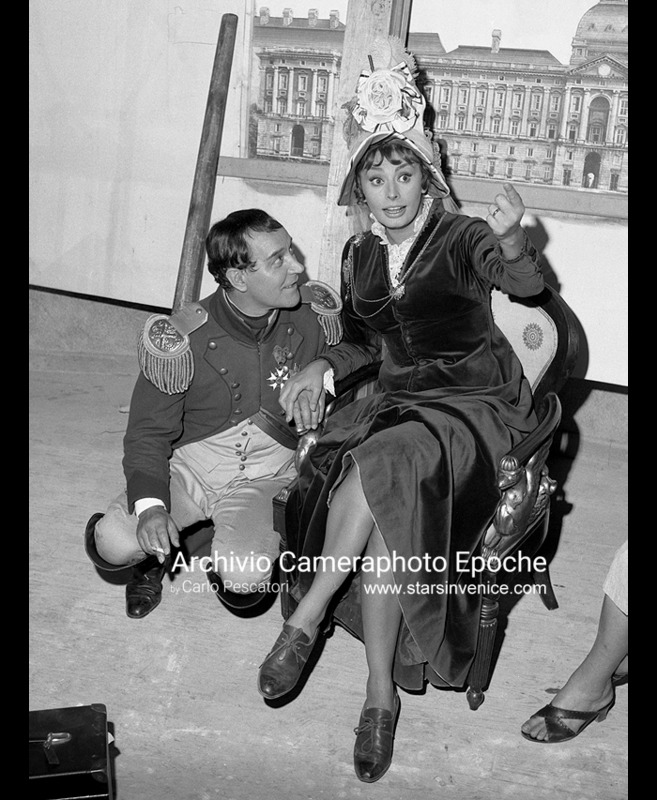 Sophia Loren sits on an chair, Napoleon next to her, Venice 1955 (Photo by Archivio Cameraphoto Epoche / © Carlo Pescatori). 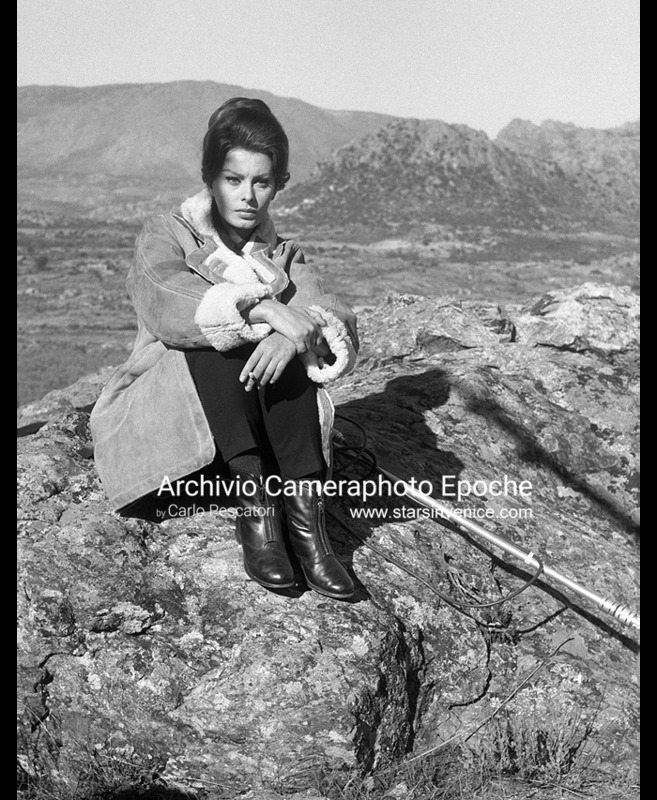 Sophia Loren smokes a cigarette during the shooting of "El Cid", Spain 1960 (Photo by Archivio Cameraphoto Epoche / © Carlo Pescatori). 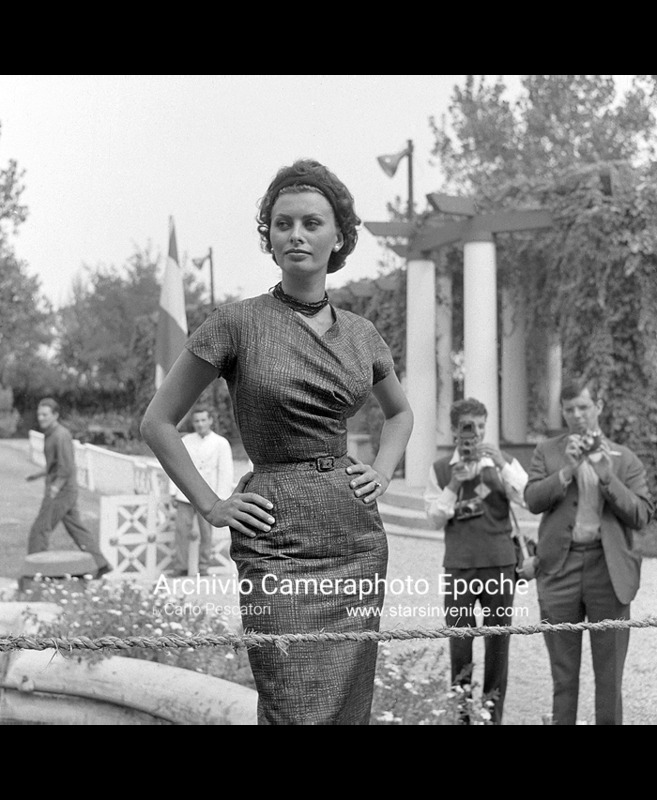 Sophia Loren posing in Lido, Venice 1958 (Photo by Archivio Cameraphoto Epoche / © Carlo Pescatori). Sophia Loren sits on the grass among photographers, Venice Lido 1958 (Photo by Archivio Cameraphoto Epoche / © Carlo Pescatori). 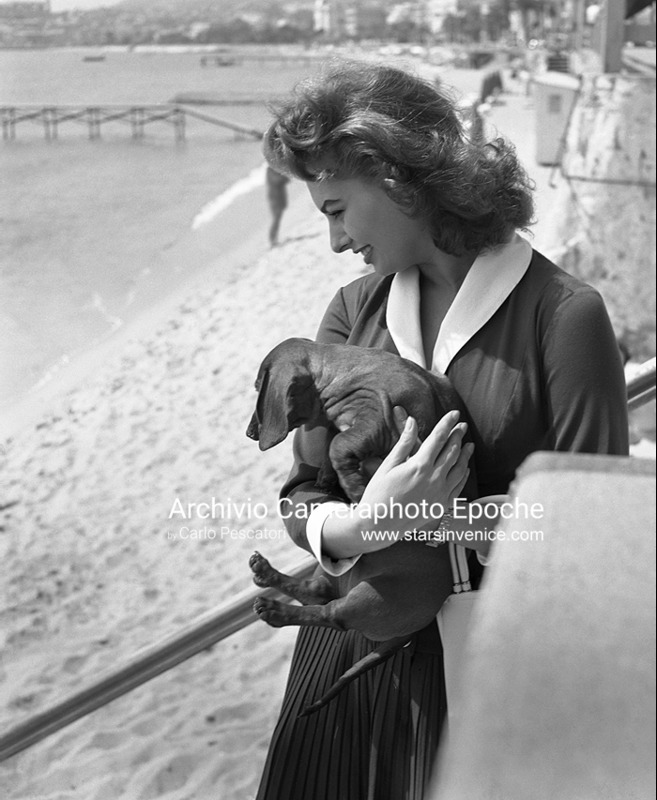 Sophia Loren holds a basset hound, Cannes' seashore on the background, 1955 (Photo by Archivio Cameraphoto Epoche / © Carlo Pescatori). 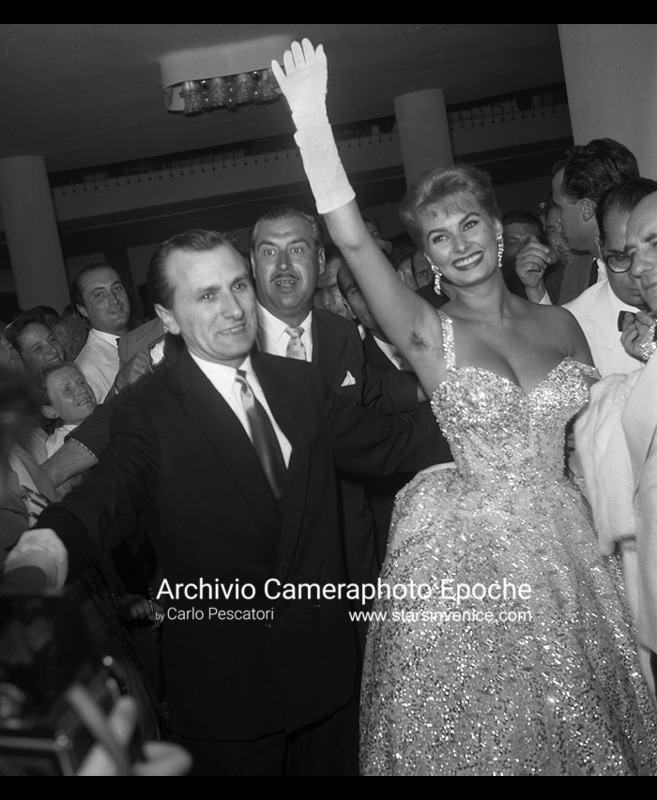 Sophia Loren claps hands at the Venice Movie Festival, 1955 (Photo by Archivio Cameraphoto Epoche / © Carlo Pescatori). 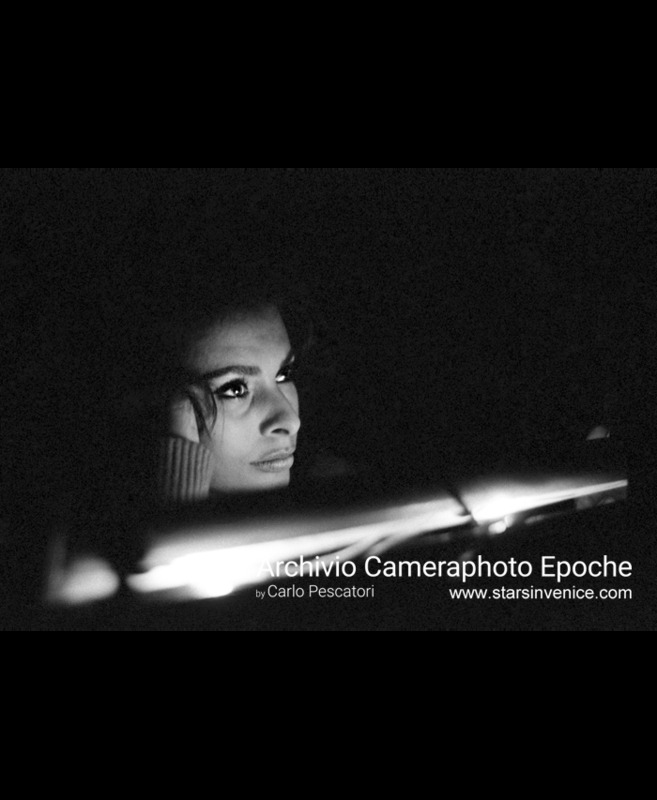 Sophia Loren during a shooting, Venice 1958 (Photo by Archivio Cameraphoto Epoche / © Carlo Pescatori). 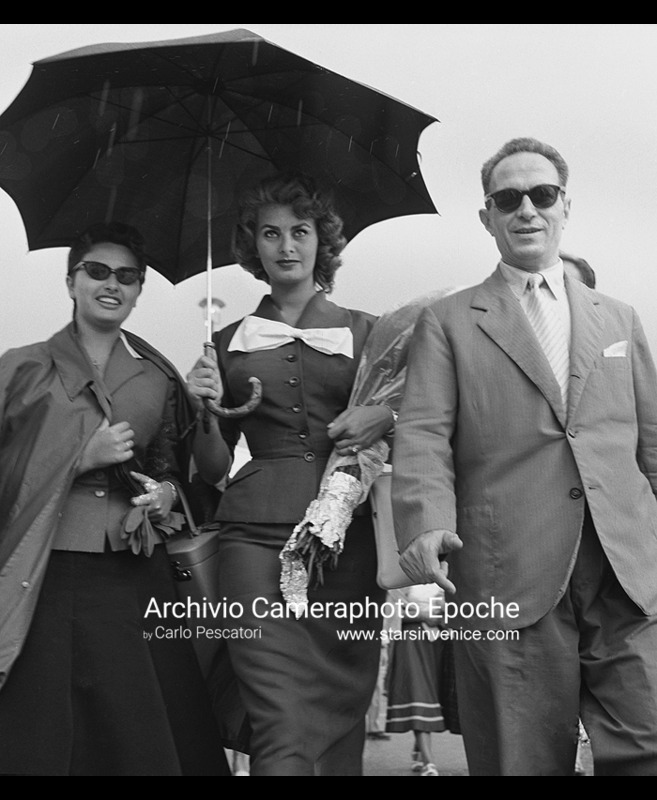 Sophia Loren and Machiko Kyo, Venice 1955 (Photo by Archivio Cameraphoto Epoche / © Carlo Pescatori). Sophia Loren sits on a terrace, Venice 1958 (Photo by Archivio Cameraphoto Epoche / © Carlo Pescatori). 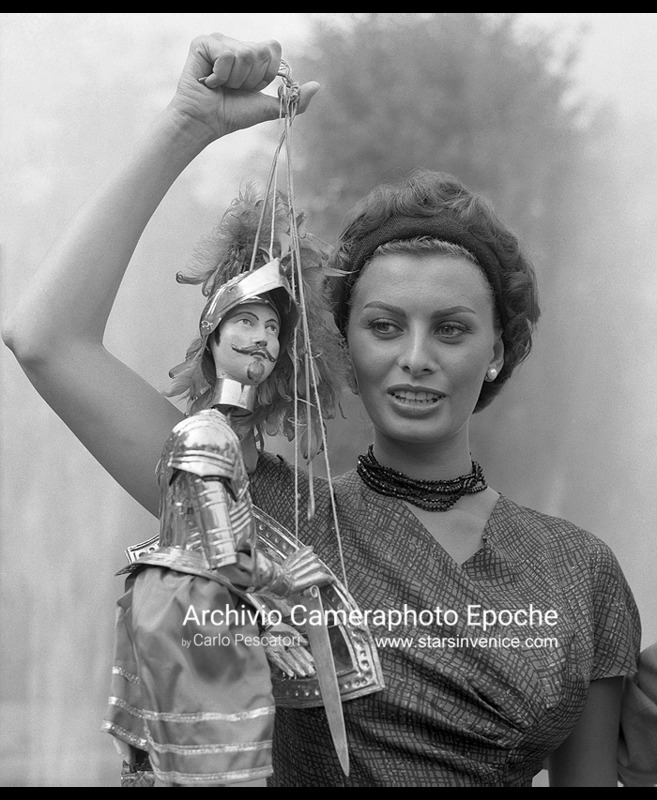 Sophia Loren holds a Sicilian string puppet, Venice Movie Festival 1958 (Photo by Archivio Cameraphoto Epoche / © Carlo Pescatori). Sophia Loren stands on a water taxi under a pouring rain, Venice 1955 (Photo by Archivio Cameraphoto Epoche / © Carlo Pescatori). Sophia Loren kisses her sister, Venezia 1955 (Photo by Archivio Cameraphoto Epoche / © Carlo Pescatori). 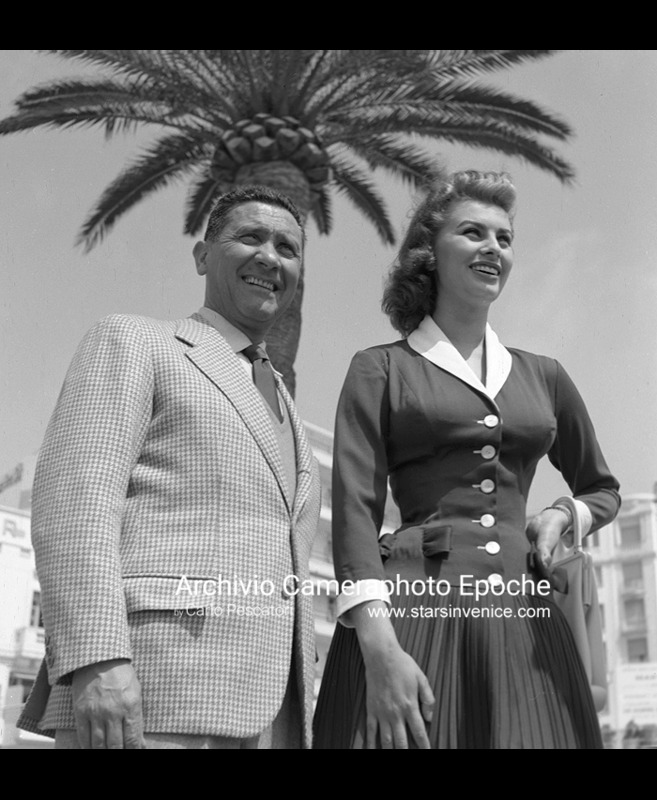 Sophia Loren and Paolo Stoppa, Cannes 1955 (Photo by Archivio Cameraphoto Epoche / © Carlo Pescatori). 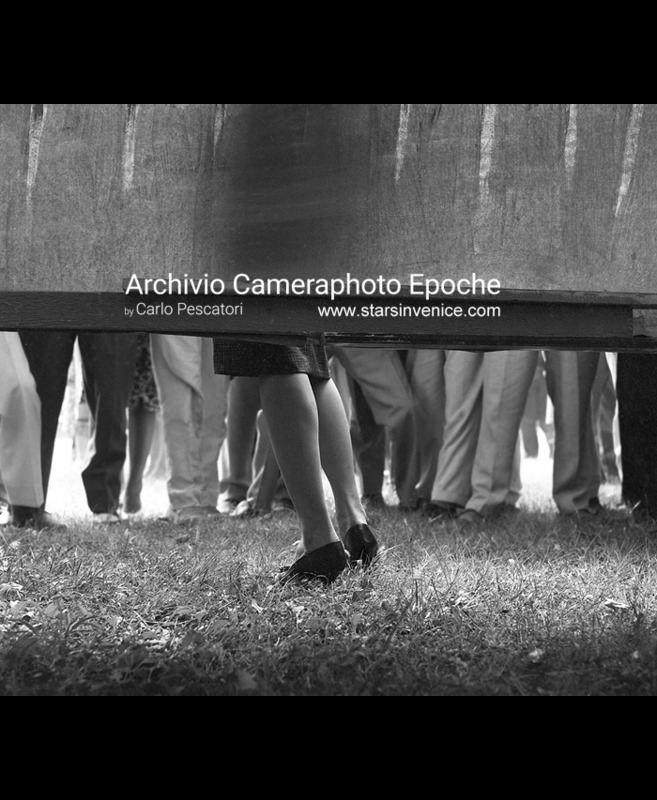 Sophia Loren's legs, Venice 1958 (Photo by Archivio Cameraphoto Epoche / © Carlo Pescatori). Sophia Loren walks with her sister, Venice Lido 1950 (Photo by Archivio Cameraphoto Epoche / © Carlo Pescatori). 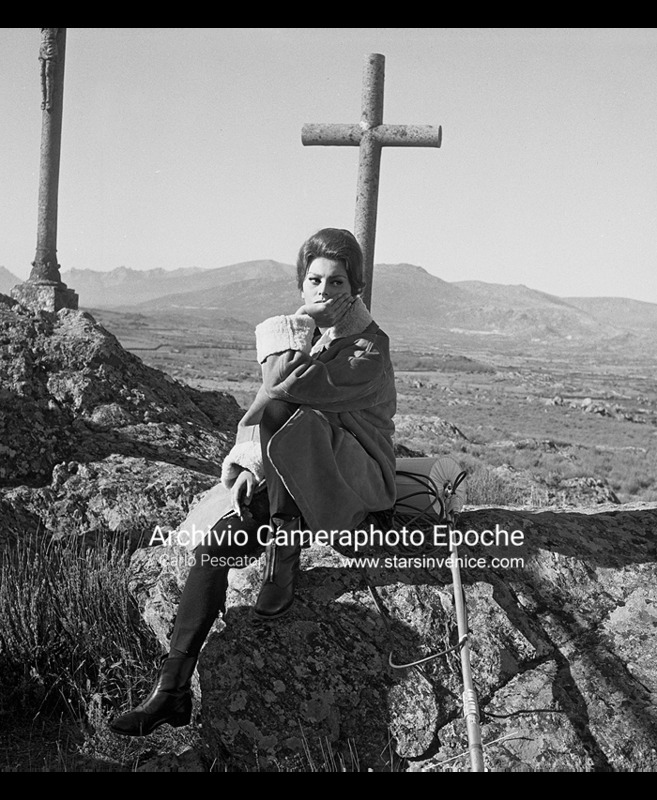 Sophia Loren and Charlton Heston rest during the "El Cid" shooting, Spain 1960 (Photo by Archivio Cameraphoto Epoche / © Carlo Pescatori). 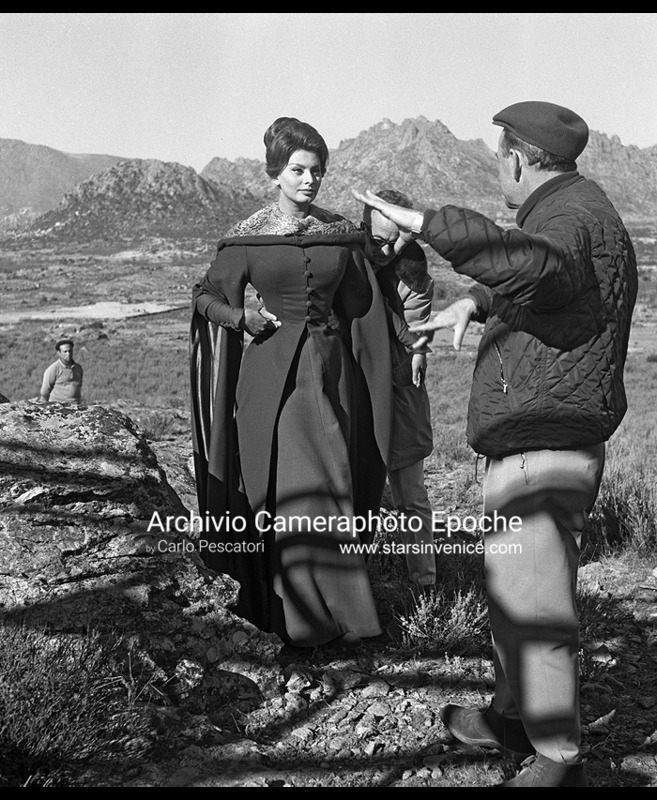 Sophia Loren talks to director Anthony Mann on the "El Cid" set, Spain 1960 (Photo by Archivio Cameraphoto Epoche / © Carlo Pescatori). Sophia Loren, Venice Lido 1958 (Photo by Archivio Cameraphoto Epoche / © Carlo Pescatori). 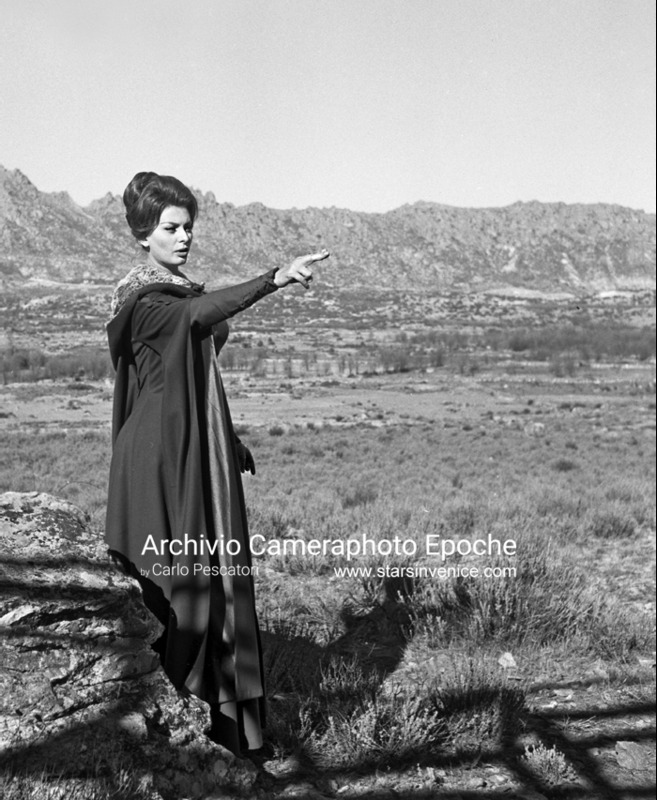 Sophia Loren during the shooting of "El Cid", Spain 1960 (Photo by Archivio Cameraphoto Epoche / © Carlo Pescatori). Sophia Loren leans on her sister's back, Venice 1955 (Photo by Archivio Cameraphoto Epoche / © Carlo Pescatori). Sophia Loren in a restaurant kitchen, Venice 1955 (Photo by Archivio Cameraphoto Epoche / © Carlo Pescatori). Sophia Loren lying on the grass during a shooting, Venice Lido 1958 (Photo by Archivio Cameraphoto Epoche / © Carlo Pescatori). 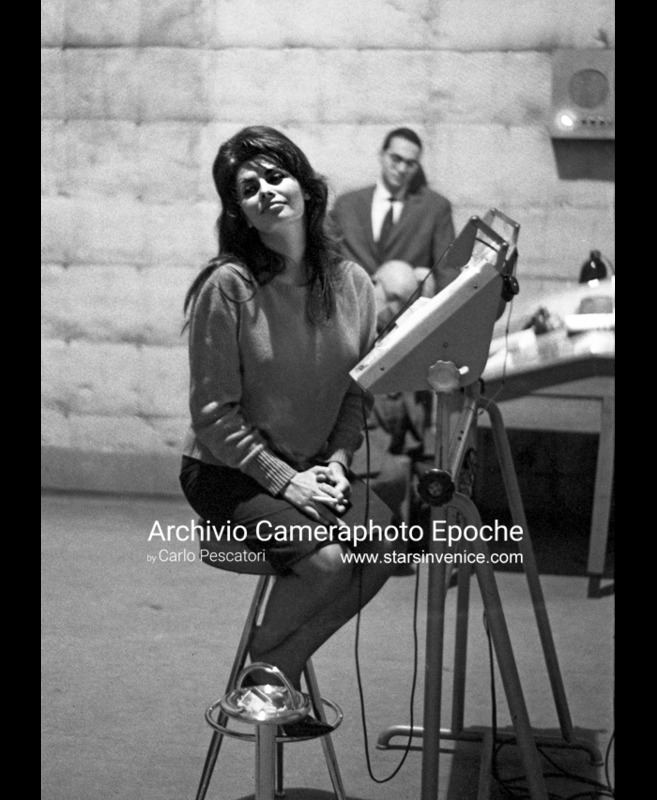 Sophia Loren sits on a chair, Venice 1955 (Photo by Archivio Cameraphoto Epoche / © Carlo Pescatori). Sophia Loren cuts slices of ham with a big knife surrounded by cooks in a restaurant kitchen, Venice 1955 (Photo by Archivio Cameraphoto Epoche / © Carlo Pescatori). 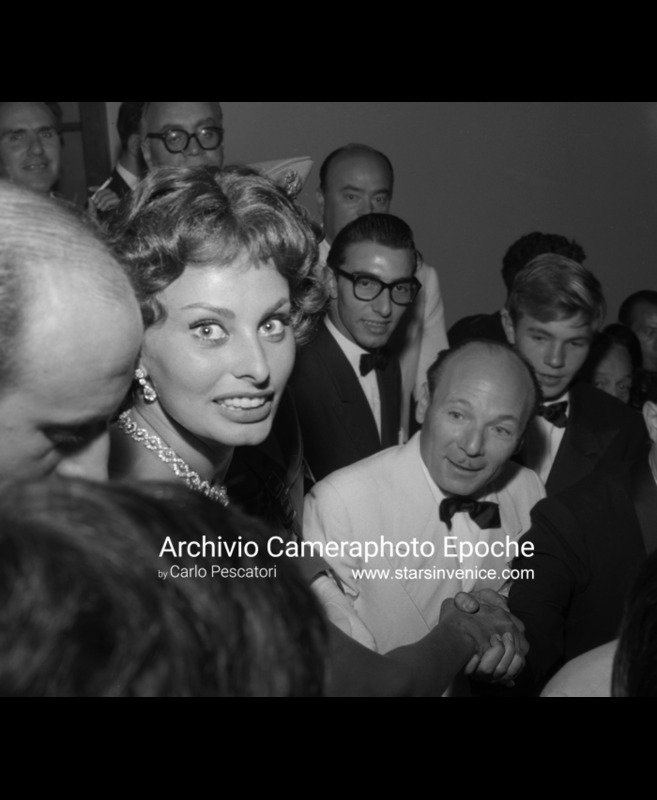 Sophia Loren greets fans at the Movie Festival, Venice Lido 1955 (Photo by Archivio Cameraphoto Epoche / © Carlo Pescatori). 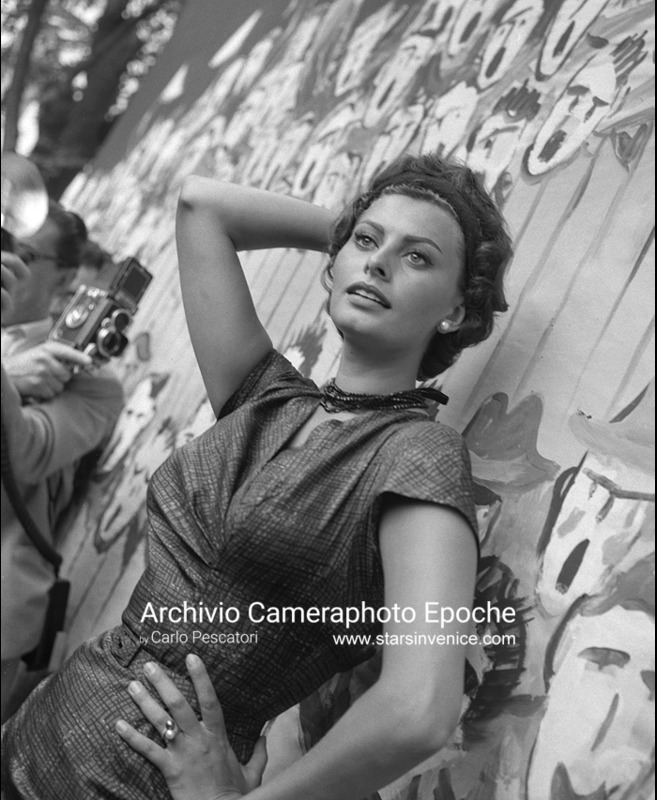 Sophia Loren, Venice 1955 (Photo by Archivio Cameraphoto Epoche / © Carlo Pescatori). 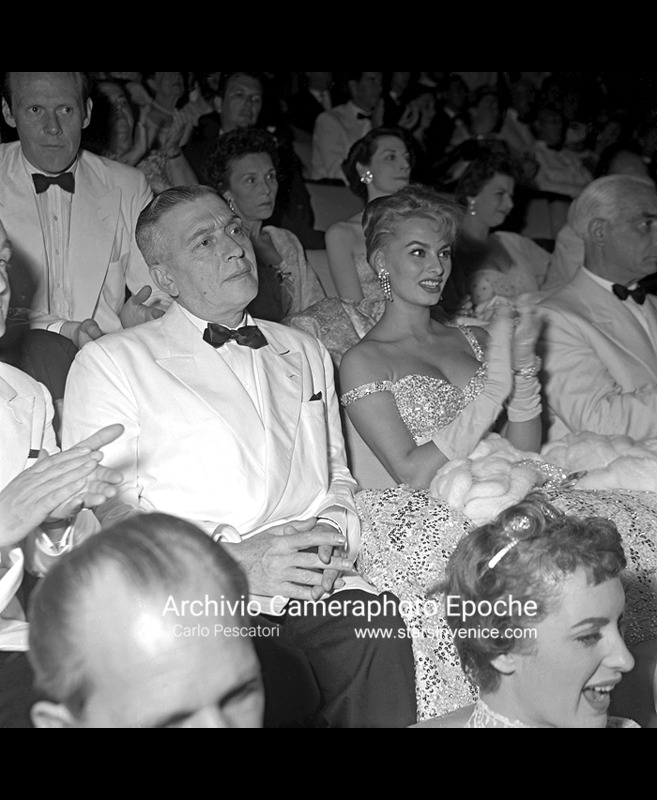 Sophia Loren sitting among the audience in a Venice Movie Festival theatre, Elsa Maxwell sitting two rows behind, 1958 (Photo by Archivio Cameraphoto Epoche / © Carlo Pescatori). 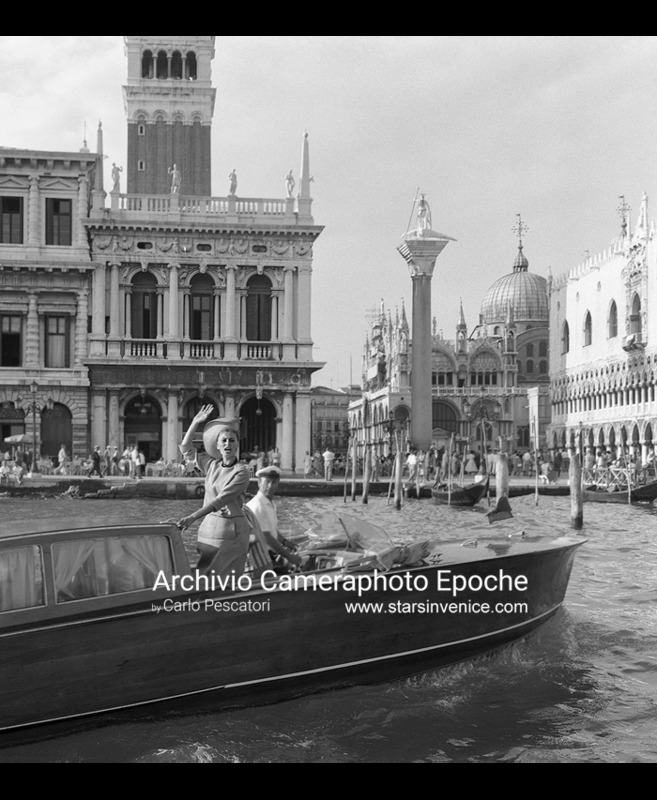 Sophia Loren greets from a water taxi in front of St. Mark Square, Venice 1958 (Photo by Archivio Cameraphoto Epoche / © Carlo Pescatori). 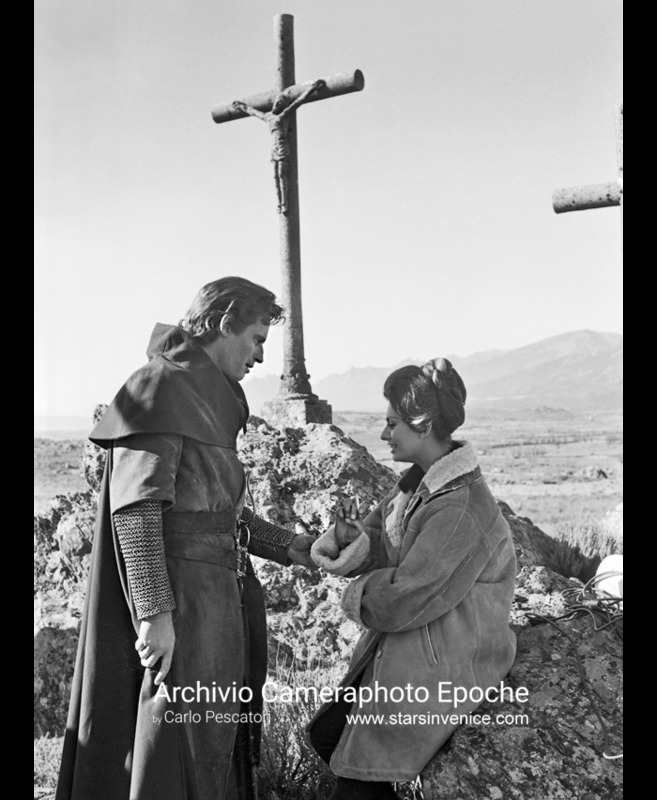 Sophia Loren and Charlton Heston in a scene from the movie "El Cid", Spain 1960 (Photo by Archivio Cameraphoto Epoche / © Carlo Pescatori). Sophia Loren sits on her suitcase on a station platform, Venice 1955 (Photo by Archivio Cameraphoto Epoche / © Carlo Pescatori). Sophia Loren sits on the grass posing for photographers all around, Venice Movie Festival 1958 (Photo by Archivio Cameraphoto Epoche /© Carlo Pescatori). 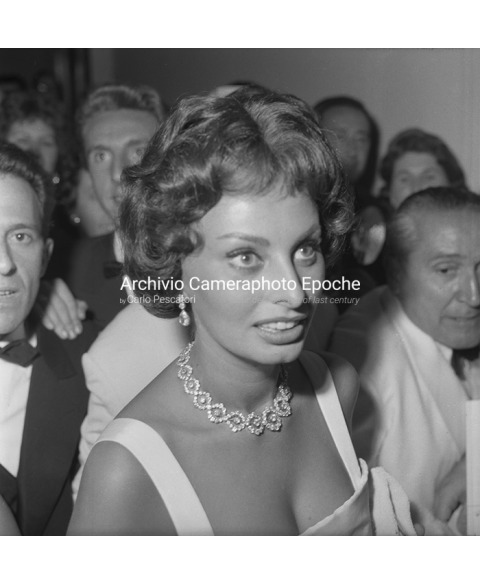 Sophia Loren surrounded by the crowd at the Venice Movie Festival, 1958 (Photo by Archivio Cameraphoto Epoche / © Carlo Pescatori). 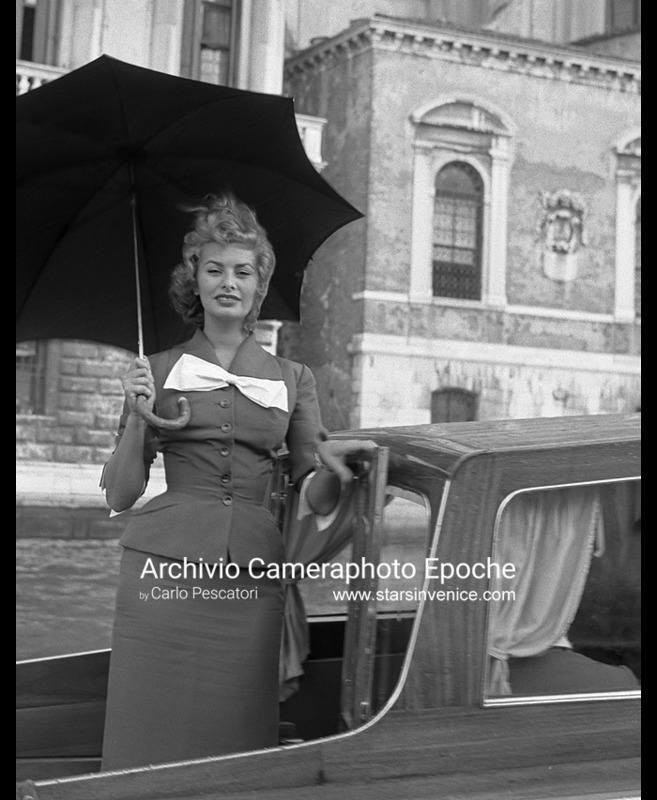 Sophia Loren stands on a water taxi, Venice 1955 (Photo by Archivio Cameraphoto Epoche / © Carlo Pescatori). 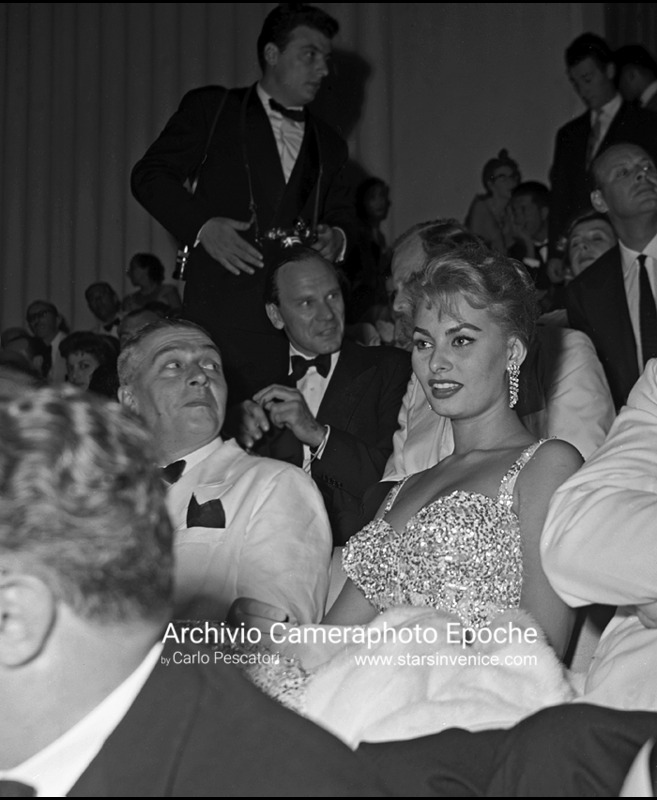 Sophia Loren sits on the grass for photographers all around her, Lido Venice 1958 (Photo by Archivio Cameraphoto Epoche / © Carlo Pescatori). 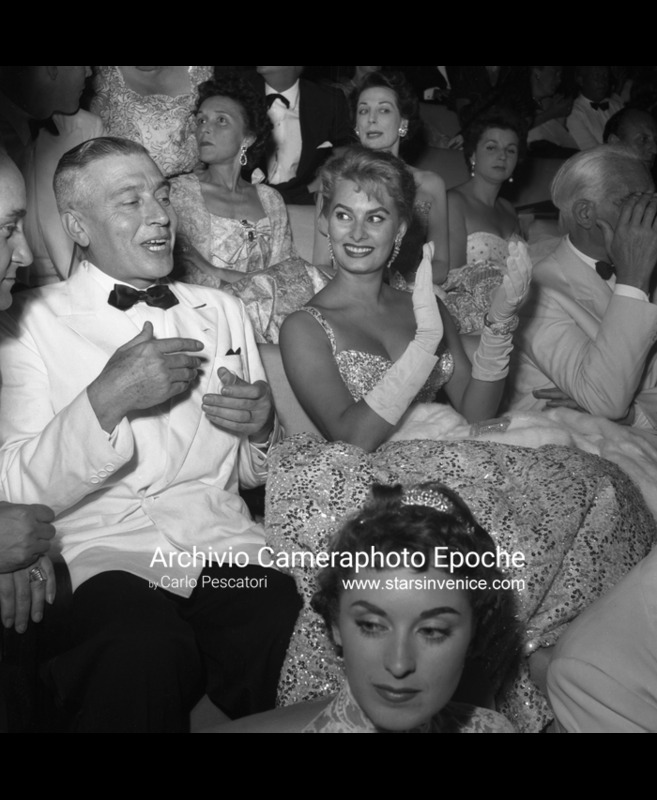 Sophia Loren among the audience at the Venice Movie Festival, talking to Elsa Maxwell. Venice Lido 1958 (Photo by Archivio Cameraphoto Epoche / © Carlo Pescatori). 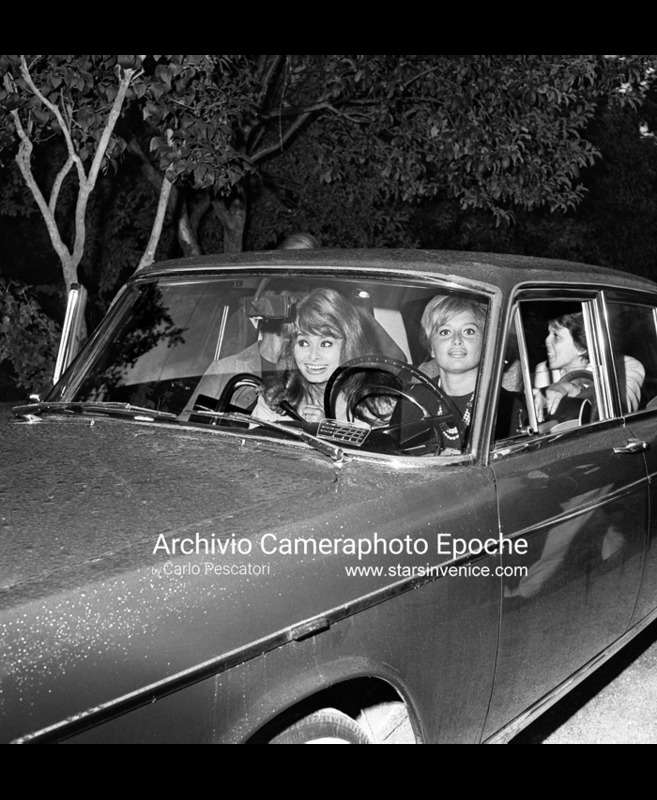 Sophia Loren gets out of a car, Venice Lido 1958 (Photo by Archivio Cameraphoto Epoche / © Carlo Pescatori).